As we have said many times in the past, the “game” of investing is so very like the children's game of “Musical Chairs.” The music is still playing loudly and well; all are dancing and circling the chairs and it seems, for the moment, that the music shall last forever. However, when the music does inevitably stop… and it will… all will suddenly dive for the chairs in the middle of the circle and there shall always be one or two participants who find themselves chair-less. Things then grow ugly. Large profits become smaller and small profits become losses. Why? Because those markets have stopped going down. When markets stop going down on bad news, they are ready to turn around. I think, at most we'll get two interest rate increases in 2017. STOCKS AROUND THE WORLD CONTINUE TO ADVANCE with nine of the ten markets comprising our International Index having risen since we marked them on Friday. The trend remains upward and although nearly ever method we know of for measuring market sentiment is preposterously over-extended to the upside, and although nearly every method we know of to measure relative value is equally over-extended to the upside, the great game of investment musical chairs continues. The “music” of monetary expansionism continues in Japan and Europe, so clearly that helps even as the policies incumbent in quantitative easing here in the US are farther and farther behind us. Illogic reigns; the “Melt Up” has begun in earnest and it will stop when it stops and not a moment before. To get the numbers out of the way, for the year-to-date stocks around the world as measured by our International Index are +3.8% while stocks here in the US, as measured by the S&P are +3.4%. The global leader… at least as far as our Index is concerned… continues to be Brazil, which led to the upside last year and which for the year-to-date is up a stunning 11.0%. Also, once again, amidst the euphoria of the moment, it is worth remembering that stocks in global terms are still well below their highs made in May of ’15 when our International Index traded to 11,185. It does seem that that “peak” wants to be tested at the very least. In our retirement fund here at TGL… and we’ve a few millions in the fund so it is not an inconsiderable sum and certainly it is meaningful to us… we are long of the shares of the largest steel producing company here in the US; we are long of gold in EUR and Yen denominated terms (having exited our position in gold/US$ late last week, a position established in the shares of the largest gold mining company in North America rather than in GLD or one of the other bullion ETFs.) and we are long of soybeans via the ETF, SOYB. 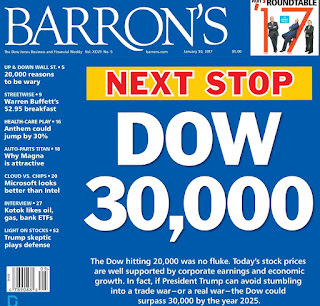 We were concerned about the stock market when we opened the latest edition of Barron’s and saw the front page cover announcing DOW 30,000! In the past, it has always been magazine and/or newspaper headlines that marked the highs and lows of the equity markets. Hence, when we opened our mail yesterday morning [Ed. Note: We sometimes don’t receive Barron’s in our post-office box until Monday morning; the rest of the world receives it on Saturday. This was one of those days!] and saw the front cover we thought: Has it happened again? Has a nation-wide publication once again marked the highs? Have we learned nothing at all from history? The jubilation over Dow 20,000 was disturbing enough, but to have had Dow 30,000 touted on the front page of Barron’s revisited historical precedents that spoke very loudly to us. 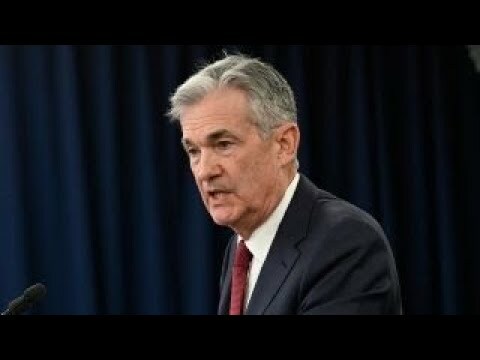 We would very much like to believe that the bull market shall continue and we would very much like to think that Dow 30,000 shall eventually be upon us, and we very, very much would like to believe that any further weakness in stocks is to be bought, but at the moment we have very serious doubts to that effect…. Very, very serious doubts.